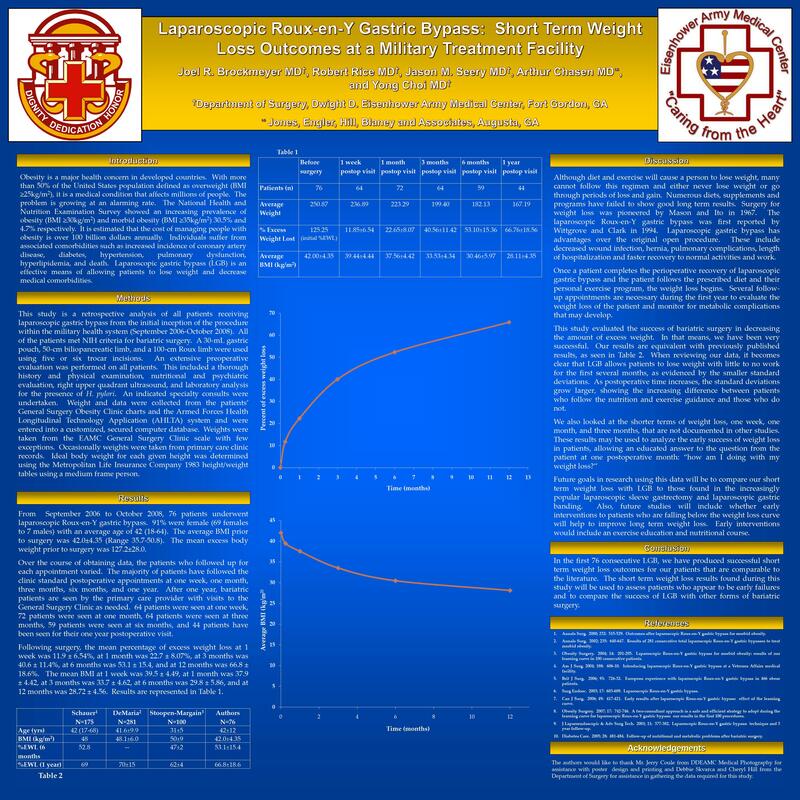 Introduction: Short term weight loss outcomes after Roux-en-Y gastric bypass (LGB) are not found in large numbers within the literature. This study establishes a weight loss curve that individual patients may be compared to at follow up visits. Methods: This study is a retrospective analysis of all patients receiving LGB from the initial inception of the procedure at Eisenhower Army Medical Center from September 2006-October 2008. Weight and data were collected from the patients’ General Surgery Obesity Clinic charts and the Armed Forces Health Longitudinal Technology Application (AHLTA) system. Results: 76 patients (91% female) received LGB over this time period with a mean BMI of 42.5 ± 12.1 (Range 35.7-50.8). The average age was 42.5 ± 12.1 years. The mean excess body weight was 127.2 ± 28.0 lbs prior to surgery. Following LGB, the mean percentage of excess weight loss at 1 week was 11.5 ± 6.64%, at 1 month was 21.9 ± 8.28%, at 3 months was 40.8 ± 12.3%, at 6 months was 60.4 ± 27.8, and at 12 months was 63.24 ± 20.6%. The mean BMI at 1 week was 39.5 ± 4.49, at 1 month was 37.9 ± 4.42, at 3 months was 33.7 ± 4.62, at 6 months was 29.8 ± 5.86, and at 12 months was 28.72 ± 4.56. Conclusions: These results are comparable to published values of percent of excess weight loss at 3, 6, and 12 months. After adjusting for age and demographics, expected short term weight loss outcomes following LGB can be established. These values can be used to motivate patients during the first year and to help physicians track the early success of bariatric surgery. As long term outcome data is collected, comparison of successful short term weight loss may be compared to successful long term weight loss to determine correlation.